Real people doing amazing things benefit from every purchase of Rawsome Creations products. I am truly grateful for each of YOU for sharing in our story. Yayasan Bumi Sehat was founded in 1995 as an Indonesian not-for-profit organization. Yayasan means not-for-profit, Bumi means Earth-Mother, and Sehat translates as Healthy: the Healthy Mother Earth Foundation. Bali has been on the cutting edge of international tourism for decades, but unfortunately tourist dollars do not filter down to the average Balinese. Mass tourism has also caused a drastic increase in the cost of living; many Balinese struggle to pay for basic items like food, fuel, school fees, and especially healthcare for themselves and their families – and healthcare is often the first to be sacrificed. Unable to pay for health services, many families elect to go without care. That was the situation Ibu Robin sought to address ...and has done so, spectacularly well. After the devastating tsunami in December 2004, Bumi Sehat was among the first responders, and remains the only organization still serving the people of Aceh. The Aceh Community Health Clinic has two birthing rooms, two postpartum recovery areas, three general health treatment areas, and a small six-bed inpatient facility. It provides full maternal care, emergency care and in-patient services. The Clinic has grown to become a center of the community, where people gather, meet, eat and share news. Many have built homes nearby. Bumi Sehat opened its new Nyuh Kuning clinic in October 2016. Each year, the Clinic performs approximately 20,000 consultations and conducts more than 500 births per year. The new Clinic is designed to be more than three times the size of the original clinic. The new clinic design is attuned to the way that midwives, doctors and nurses practice. It is earthquake resistant as well, in keeping with the volatility of the region. Getting to know Ibu Robin as I visited over the next years has been a joy. Bumi Sehat is a village-based organization of dedicated families, midwives, doctors, nurses, teachers, and volunteers from Indonesia and around the world. When I visit, there have often been many babies born in the previous 24 hours, and Robin is present at each birth. 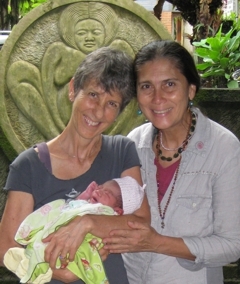 It is impossible to overstate how important Ibu Robin has been to Balinese women and children. Caring for the women and the future of this country, she makes a difference every day of her life. Never say that one person can't make a difference: Ibu Robin does, and we are proud to help her. Imagine being without parents in a developing country. Now imagine also being handicapped! I certainly can't, and it's likely you can't either. 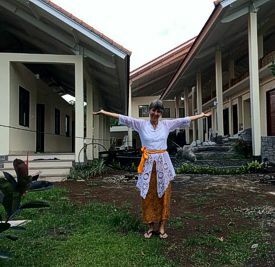 Yayasan Widya Guna Orphanage is one of the only resources for handicapped children on the island of Bali. These challenged kids would have no other opportunity to live a normal life were they not a part of the safety net provided here. Each day, the children enjoy meals, education, computer time, art class, and cultural education with dance for the girls and gamelan lessons for the boys. The children are incredibly happy and on their way to becoming amazing adults. The founders, Ketut and his wife Nyoman, are two amazing people! They have dedicated their lives to providing the basic necessities for the children who find their way to the orphanage. When it opened in 2006, Yayasan took care of 12 orphans and a few very poor children from the village of Bedulu. This has increased to its current size of 100+ due to the number of disadvantaged children living locally and the open arm philosophy that always has room for one more. The facilitates and aid have expanded to meet the demands in an incredibly inspirational fashion. The children go to the local school in the morning then come to the Yayasan in the afternoon. Since disabled children are not integrated into Balinese schooling, the Yayasan welcomes these children with a range of disabilities and offers them full education, therapy and support in a number of forms. I am always inspired by the Widya Guna children: what might seem to us an overwhelming disadvantage in a tough environment is, for them, simple fact, and not at all insurmountable. With our help, and help from many others around the world, their work continues to thrive. In 2015, it became obvious to me that charitable work that suited my particular interests – children, education, food, and the welfare of our planet – also needed support right here in my home state, and I started looking for a couple more organizations that were small enough to benefit from our donations. I looked around for quite awhile for an organization that combined my love of food, education, and children, and I was inspired to find Life Lab in Santa Cruz, California. I love the idea of “30 minutes of mandated dirt time” for the every child's school day! Starting in 1979, Life Lab pioneered getting school children into the garden to make friends with their natural food sources. 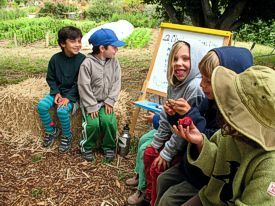 Their influence on the Real Food for Children movement reaches far beyond their two-acre garden classroom ... but that's where the hands actually get dirty: staffers work and play with children of all ages, focusing on garden education from soil to table. Children participate in school field trips, summer camps, and internships. Teachers from around the world can find garden resources, curriculum assistance, consultations, and professional development for training our future farmers and nutrition leaders on the Life Lab website. Since so many children here in California have family members who harvest and work the land every lighted moment of each day, I am honored to be able to help them gain an early hands-on appreciation for the special contribution their families share with all of us. The experience changes forever the relationship between the smallest 'sprouts' (ages 4-7 years old) and the food, insects, bees, and weeds encountered in the garden. That's where the magic starts! Helping disadvantaged children attend Life Lab's very popular weekday 'fun-in-the-garden' program is right in my wheelhouse. There are many other similar local programs, and I encourage you to check with your own school district to find out what they're doing along these lines ...and help them get started if they're lagging. But for Rawsome Creations, Life Lab's 37 year head start and continuing enthusiasm was the deciding factor. The Ceres Project is local and a long time favorite. I met Cathryn Couch, the founder, several years ago when I began healing from my own bout with cancer. I was immediately thrilled by her concept of training teens to create healthy meals and offering those meals for free on a weekly basis to folks battling health challenges in their community. Involving young people as volunteer gardeners and chefs, giving them hands-on experience from farm to table with nutrient-dense, fresh, healthy foods, then providing these healthy meals to people who are battling health challenges strikes me as a resounding win-win-win that deserves our support. An essential element of this program is its ability to be replicated into other communities. The Ceres Project provides a free Start-Up Tool Kit that helps communities around the country start their own programs has extended the idea to eleven communities, including Bay Village, Ohio; Geneva, Illinois, and Santa Cruz, California. 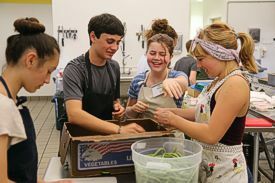 I am proud to help Ceres with funds from our Rawsome Creations product sales so they can achieve their goals of assisting teens in learning life skills and healthy food preparation at the same time as providing life-giving nutrition to neighbors in need. Dr Dickey Nyerongsha has been my personal physician for almost 20 years. In traditional medicine practices they say if you get sick, your physician is not doing their job. With Dr. Dickey's support through the years, my personal health journey has been enhanced utilizing gentle herbal remedies and teas to support overall health. Integrating body systems and medicinal food combining with the natural rhythms of earth and the seasons is a winning combination for me. I have informally supported The Nyerongsha Institute, Dr Dickey's charitable foundation, for many years and recently chosen to add her to our Rawsome Creations portfolio for much needed funds from our nut milk bag projects. 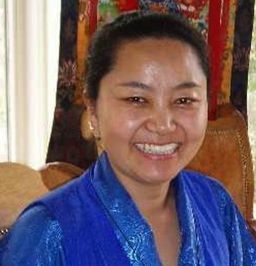 Funds are directed to those most in need in her home country of Tibet. Through earthquake relief, the Nyerongsha Orphanage and quarterly monastic support our contributions help support a treasured way of life for these gentle people.